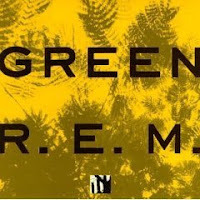 Do you know why the cover of R.E.M. 's album "Green" is orange? It's because green and orange are inverse colours, and if you stare at something orange for a while then close your eyes, or look at a white surface, you'll see green. What happens if you stare at something green for a while? I'll give you a hint: laranja is Portuguese for orange, and these are laranjas Bahía, or Bahían oranges. They're also called laranja peras, which means orange pears. Guess what's inside! The laranja Bahía isn't the most amazing orange I've ever eaten - it's a little bit dry, not all that sweet, and doesn't have a super-strong orange flavour. But I love this fruit, because it's oh-so-pretty and orange. 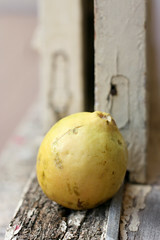 Our Fruit of the Day today is melão amarelo, which literally translates as yellow melon. 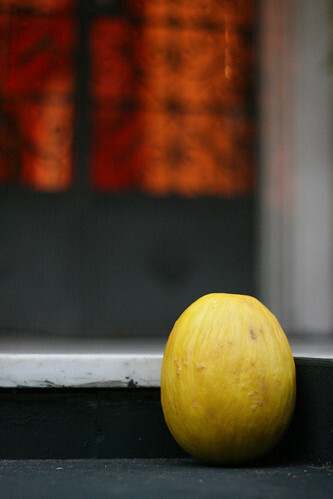 We found the yellow melon in an exciting section of the grocery store, tucked in between the guava and the passion fruit. And it is indeed a lovely shade of yellow. In a race against the waning daylight, I cut the melon open to find a pale green fruit that looks and feels like a cucumber, and tastes a lot like an under-ripe honeydew melon. Maybe we picked a yellow melon that wasn't quite ready for prime time, or maybe it's just a super-mild fruit, but either way, we were underwhelmed. We'll blend it with some frozen strawberry pulp tomorrow morning and see if that doesn't perk it up a little. 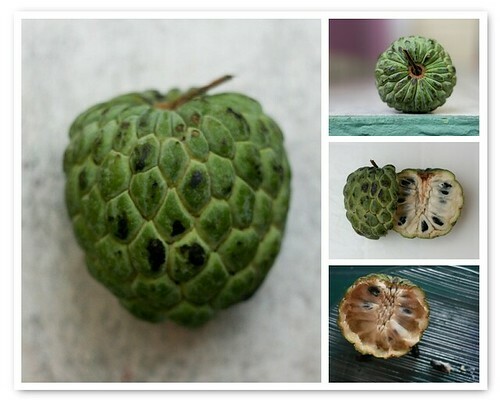 After trying today's fruit, the pinha, or sugar-apple, I may have to retool the UFF Fruit Ratings, because guys? This fruit is DELICIOUS. It may well be the most delicious fruit I have ever eaten. As has been the case with many Fruits of the Day, the pinha doesn't look like much, kind of like a closed, green pinecone. When we first picked it up it was much squishier than either of us expected (we both thought it would be hard, kind of like a shell). We also had no idea what to expect from its insides, and again, they didn't look like much. 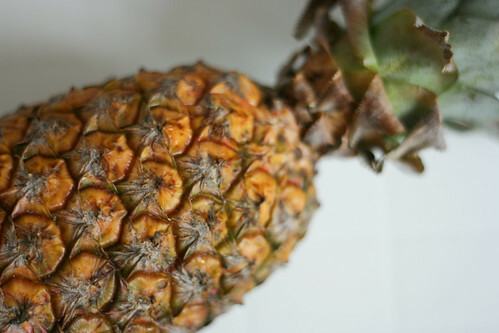 The pinha is filled with hard black seeds, each of which is encased in white pulp. 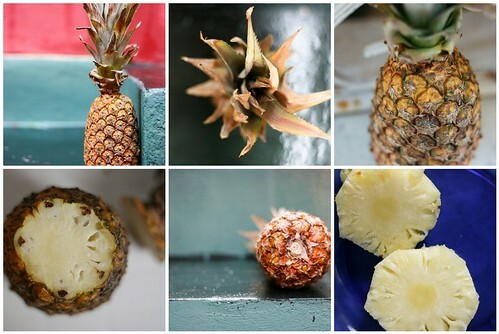 The consistency of the pulp is similar to that of the cajú or a soft banana, kind of puddingy. And it tastes just like custard. We took different approaches to its consumption: Ken used a spoon to scoop out several seeds at once, while I pulled out one seed at a time and ate the fruit before spitting out the seed. And we both can't wait to have another one. Limão is Portuguese for - you guessed it! - lime! 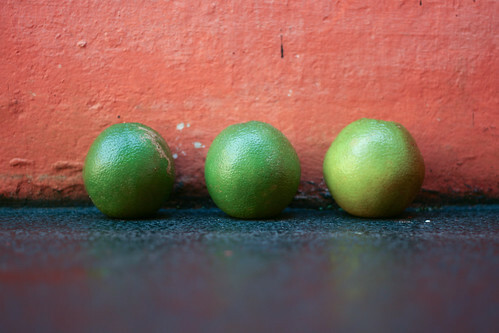 OK, it isn't incredibly exotic, and even if you don't have one in your fridge right now, you've probably seen a lime somewhere in the last few days. And just maybe, if you're lucky, you sweet-talked someone you love into juggling a few before he mixed them up into a tasty caipirinha. I happen to be exactly that lucky. Cut each lime into 8 pieces and put in a mortar or other suitably heavy mixing bowl. Spoon in the sugar and muddle with a pestle until the limes are flat and the lime juice is squeezed out of the lime bits. If your limes aren't particularly juicy (hey, it happens to everyone sometimes), you can add a splash or two of water. 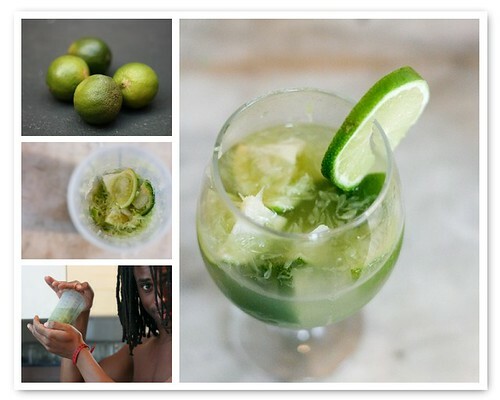 Pour the lime/sugar mixture into a shaker, add the cachaça, fill the saker with ice, and shake it like a Polaroid picture. Distribute between two glasses (do not strain). If you're fancy you can garnish it with a lime slice, but ours don't usually last long enough for that. *Cachaça is alcohol made from the distillation of fermented sugar cane. Wikipedia just told me that 1.5 billion liters of cachaça are consumed annually in Brazil, compared with 15 million liters outside the country. At RS$5, or about $2.50 US per 1L bottle, I'm not surprised. Anyway, if you can't find cachaça or it's too Richie, feel free to substitute vodka and call this tasty bev a Caipiroska, like they do in Argentina. Today's fruit is one that will be familiar if you've ever been to a Mexican restaurant or attended a Super Bowl party. But have you ever seen an avocado with a 14" girth? My favourite way to eat avocado is with some salt and a spoon, and I make a mean guacamole, if I do say so myself. But Brazilians like things sweet, including avocados, and you know my stance on "When in Rome..." So, we added some lime juice and sugar and transformed this gigantic fruit into creme de abacate, or avocado cream, following the recipe on Maria-Brazil. The lime juice wasn't such a stretch since I put that in guac anyway, but it pained me a little to mix in the sugar. In the end, we sprinkled a bit of salt on top, and it wasn't bad at all. We arrived in Salvador a week ago, and already I never want to leave. 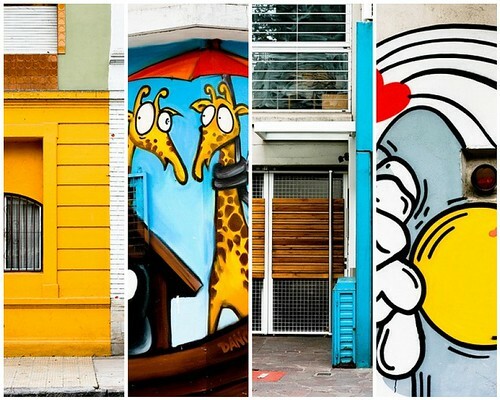 When we told our friends in Buenos Aires that we were planning a trip to Brazil, they universally said the same thing: "Oh, you'll love it, the people are wonderful! And be careful." There was always that warning. Our friends who had been in Rio for Carnaval said the same thing: That they'd loved the city and the people, but that it was incredibly crime-ridden and dangerous and that they had to be very careful when leaving the hostel. Honestly, I couldn't reconcile these things. How could I love a place where I'd always be on my guard? I didn't get it. Until I spent a week here. Salvador is a city of about 3 million people. It has an old area of town called Pelorinho, that has two levels. The Elevator Lacerda connects the two. It costs 5¢ to ride, and is the only safe way between the two levels, as the steep streets between them are considered dangerous even during the day. Cars don't have to stop at red lights at night because the risk of robbery makes it unsafe to stop. During festival nights in Pelorinho, and of course during Carnaval, you can expect to feel peoples' hands in your pockets, which is why it's better to wear shorts with no pockets and keep money pinned inside. Why, then, is it so wonderful here? I still don't quite understand it. I guess for one, I'm OK not bringing my camera out with me when I can tote inexpensive and very photogenic fruit back to the hostel and safely snap away there. When we go to the beach, we only bring a few reais with us for snacks, and lunch for both of us with beer never costs more than $10. Every time we go to the grocery store, super-happy Brazilian music is being played, and even the guy selling shrimp skewers on the beach is singing. Last night we went out for RS$2.50 caipirinhas, then danced Samba in our hostel, and we'll probably do the same thing tonight. 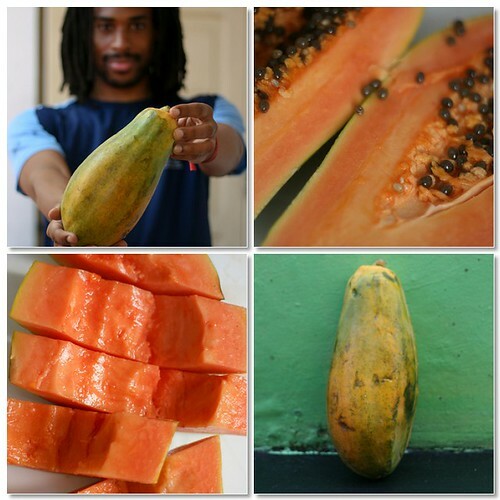 Now let's talk about papaya, shall we? In Portuguese, it's called mamão formosa, and this fine speciman weighed in at 1.1kg and cost us all of 1.27 reais, or around 65¢. Mamão formosa isn't a small fruit (the rather handsome fruit model is included for scale), and it's filled with seeds that look like peppercorns. Papaya flesh is soft and scoopable and you can - and should - eat it with a spoon. It has a very mild flavour and isn't very sweet, and if I made it into juice I'd probably add a bit of sugar (or heck, a mango) to sweeten it up a bit. When we woke up this morning we headed straight for the beach, before the rain clouds had a chance to gather. We weren't disappointed, especially with our breakfast of beach-cheese and a coconut popsicle (which was basically just coconut and milk and sugar on a stick, and will give the grilled cheese a run for its money as my favourite beach snack). About an hour into our lounging I realized that my SPF 15 wasn't going to protect my creamy white Canadian thighs against the tropical sun. Luckily, you can buy little bottles of sunscreen right on the beach! Oh, those enterprising Brazilians. We summoned a sunscreen dude over to enquire about the prices of his wares. I pointed to the little (60mL) bottle of SPF 30 and asked how much it would cost. Me (to Ken): How much? Me (to SD, in Spanish with my best Portuguese accent): No, that's OK, obrigada. Me: I understand, but no thanks. Me: Yes, it's OK, obrigada. SD: OK, 10 reais, so you will be my customer. Me (to Ken): Pay the man. My mom, with her superior bartering skills, will be proud. Like yesterday's maracujá, today's FotD is also nondescript-looking on the outside. In fact, I bought this one not knowing anything about it except its name, goiaba (I don't think it has an English translation), and that it smelled delicious. Ken predicted that it would be red inside, and I resisted looking it up until after we cut it open to see for ourselves. Turns out it's watermelon-pink, and oh-so-pretty! Goiaba flesh is soft enough to scoop out with a spoon, so that's how we ate it. It was sweet and mild and was kind of the texture of mousse or soft ice cream. It did have a lot of little seeds, so it would probably be better pureed and strained. Update: It's guava! Thanks Kari, and Parabens! Today's FotD is a perfect example of why not to judge a book by its cover: At first glance, it looks kind of boring and wrinkly. But inside the maracujá, or passion fruit, is the plant-equivalent of caviar. 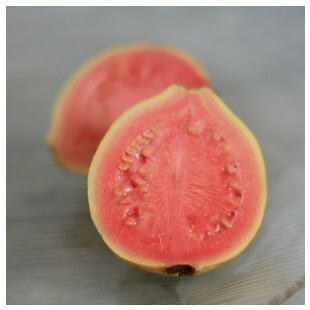 It's filled with exotic-looking and super-flavourful pulpy little seeds. We threw it all into a blender with a mango and a splash of water, blended, then strained the seeds for a yummy breakfast smoothie. No sugar required. Not only is today my birthday, here in the Southern Hemisphere, it's the first day of winter. I have to say, I could get used to having a winter birthday if I get to celebrate in flip-flops on the beach. Today Ken introduced me to one of Brazil's celebrated culinary treats: Cheese on the beach. It's the best thing ever. People walk along the beach carrying a little charcoal grill and a tupperware container full of pieces of cheese on skewers. For around a dollar they'll sprinkle oregano on the cheese and grill it up over the hot coals (somehow, like the provoleta we love so much in Argentina, it doesn't melt into a gooey mess). Voilà: a delicious salty treat that you don't even have to worry about getting sandy. Today's FotD is the coco verde, or green coconut. On our daily strolls through Barra we pass at least half a dozen fruit stands, and all sell coco verde for under $1 (usually closer to 50¢, which is what we paid). The vendors use a big machete (is there such a thing as a small machete?) 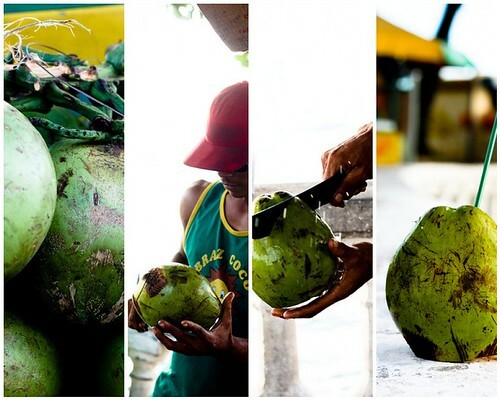 to level the bottom of the coconut and neatly cut a hole in the top into which you stick a straw to drink the coconut water. It is mild and a little bit sweet and very refreshing, and makes the perfect drink with which to toast birthdays or solstices or the simple fact that you are drinking coconut water right out of a coconut. It's easy here. I've been wearing flip-flops around because it's impossible to walk fast in flip-flops, and also, everyone's sporting a pair of Havaianas here, when they're wearing shoes at all. When in Rome, you know. I don't speak any Portuguese except to say thank you, and it doesn't matter, because everyone is smiling and patient and happy. I suspect that living in a place with a daily high around 25°C in the winter will do that to a person. Today's FotD is the manga rosa (pink mango). I'm sure you recognize her! I was kind of hoping that this mango would be pink inside, but it looks a lot like its cousin, if only slightly smaller. It cost less than 50¢, and was everything I want in a mango: colourful, sweet, and oh-so-juicy. I could eat one of these every day, and in fact, I probably will while we're here! 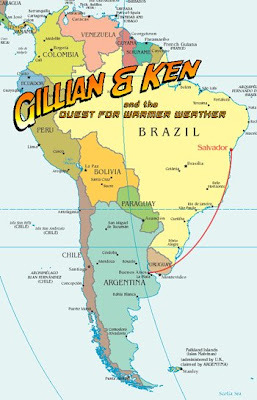 We arrived in Brazil on Wednesday evening, just in time to drink a caipirinha before the bar at the hostel closed. Yesterday we explored our neighbourhood, Barra, and picked up some fruit at the grocery store. The fruit here is insanely fresh and cheap - we bought a quarter watermelon for about 75¢, and a green coconut (that a dude on the street will hack open and stick a straw in for you) is about the same. 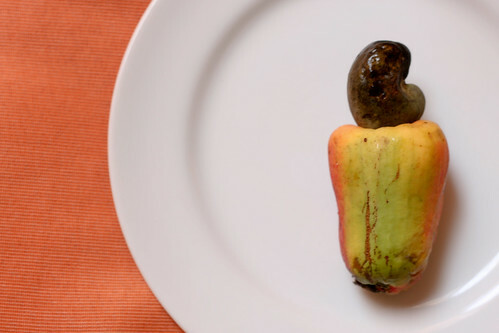 This is a cajú, which you might know as cashew. Did you know cashew nuts grew like that? Me neither! With only one nut per fruit, it's no wonder cashews are so expensive. The cajú was pretty cheap (around 40¢ each), but the fruit itself had a weirdly chalky/dry texture, and I wouldn't buy it again. This morning, however, we had cajú juice, and it was delicious. Back in mid-February after a particularly grueling week of freezing temps in the NYC, I announced to Ken that I'd had enough of winter. Not a moment too soon, either, as on Monday we learned that you can order ice cream and have it delivered to your doorstep in about 20 minutes. That is all kinds of dangerous. I'm packing, which you know from many previous posts I love more than anything, if by "love" you mean "hate." Today's internet procrastination is brought to you by a site called 1000 Awesome Things, that you should go look at. Then come back here tomorrow for updates, and also an awesome graphic (of which I am quite proud). 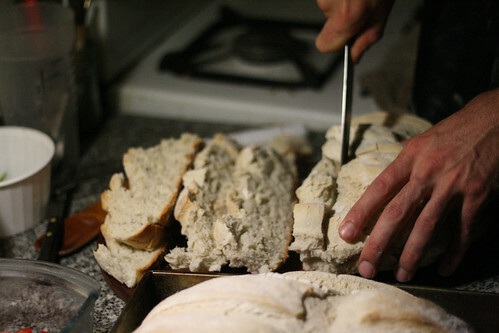 Hello, Bread., originally uploaded by Kitty LaRoux. Last night we went back to ¿Dónde me trajiste? so that I could eat this bread again. I mean, come on, wouldn't you? One of my most favourite things about Buenos Aires is that everyone kisses everyone here. It's like a handshake or a casual wave, only it's always a cheek-kiss; right-cheeks, please. And absolutely everyone does it, everywhere, to say both hello and goodbye. At the gym, big muscly guys greet each other with a kiss. It's how I say hi to my trainer, Adrián. (I'm not complaining; it's the closest I'm going to get to making out with a 24-year-old again in this lifetime.) When we had our party a couple of weeks ago, whenever someone new showed up, it took him or her 10 minutes to make their way around the room, smooching everyone up. Just this week, I went to a spinning class*, and as I was setting up my bike the instructor came over and greeted me with a kiss. And our really really awesome Spanish teacher, Sofía, signs all her emails "un besote". Beso = kiss, and besotee is a littleBIG BIG kiss (per Sofía, who just corrected me on this important matter) - which happens to be my favourite kind. On Wednesday we went to dinner with Sofía and a bunch of other teachers and students from her school. The "restaurant" at which we dined is a puerta cerrada or closed-door restaurant, a phenomenon pretty common here in Bs.As. It's like going to a dinner party that you pay for (the restaurant is really someone's apartment). Usually a puerta cerrada restaurant is only open 2-3 nights/week, and is by reservation only. In fact, when we visited Bs.As. in 2007 we dined at an excellent puerta cerrada called Casa Felix that had just then been noted in the NYTimes. Anyway, on Wednesday we went to ¿Dónde me trajiste? which translates to "Where did you bring me?" - so named because the restaurant/apartment is on a quiet street and doesn't have any signs outside to indicate that you might be in the right place. We had a lovely meal of red-pepper and eggplant bruschetta (served on the bread of my dreams, seriously, if I ever find the source of that bread I will need more than spinning classes to save me), homemade pasta with a rich olivey sauce, and a panqueque (crêpe) filled with apples and served with perfectly-whipped cream. We were treated to the guitar-and-vocal stylings of Tango not for export con la Orquesta Onírica, and their invited guest, Pablo Fayó. All this, with wine and fellowship, ran us only 50 pesos (around $15) each! Oh, and totally worth the cost of entry was sitting beside Ceci (one of Sofía's co-teachers) and learning that her best friend (also named Ceci - confused yet?) lives in - get ready! - WATERLOO. Yes, that Waterloo. El mundo es chico, indeed. *I actually went to 5 spinning classes this week (dig my bad self! ), which was a direct result of Adrián making me weigh myself on Monday morning. Let's just say, I guess it doesn't matter how many vegetables you eat if you slather them in dulce de leche. P.S. Having my own puerta cerrada, wherever we may end up, is my current #1 dream. Dare I say goal? OK, I'm going to say it. It's my #1 goal. Hello, Universe!